1.In large saucepot, heat marshmallows and butter over medium heat 5 minutes or until melted and smooth, stirring occasionally. Add chocolate chips and stir with wooden spoon until chocolate melts and mixture is well combined. Remove saucepot from heat; stir in oats. 2.Line baking sheet with waxed paper. Using gloves or moist hands, form chocolate-oat mixture into 1½-inch balls and place on prepared baking sheet. To form each ball into a nest, place ball in palm of hand; press down on center of ball with fingers to flatten ball and form indentation in the center. Place nests back on baking sheet and cool completely. 3.Transfer nests to airtight container and store at room temperature up to 3 days. 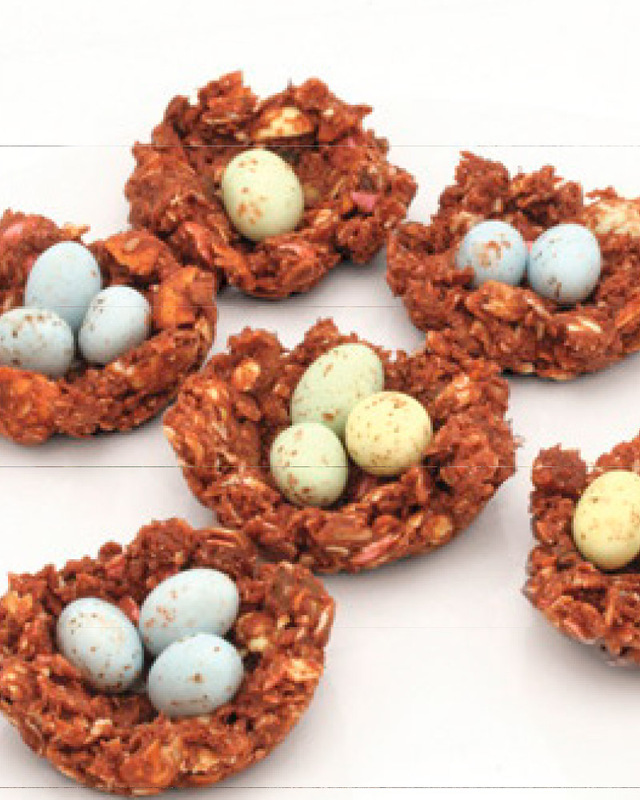 Fill nests with candy, if desired, just before serving.